At the risk of over-extending the business metaphor offered by rock climbing (and the even greater risk of boring readers who don’t have the slightest interest in my climbing rehabilitation), here is a brief update on my injury situation; closing with the normal technology-focussed twist. 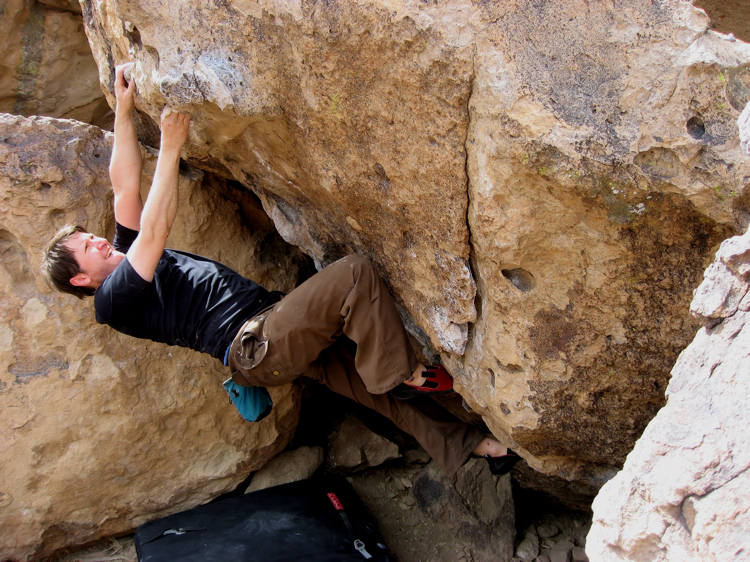 I suppose that part of my motivation in composing this piece lies in the fact that some of my recent climbing-related writing has been on the negative side; albeit focusing on business lessons that can be gleaned from my past rock climbing mistakes. Instead this article adopts a more positive tone looking for ways in which signs of progress in a sport can set you up for professional success. I have previously explained how I managed to injure my hand climbing a while back. Given the horrendous popping noise my left ring finger made when I hurt it, it is a reasonable assumption that I have a partial pulley tear. Having already not climbed at any serious level for some time, this injury kept me away from both rock and wall for several months. On the odd occasion that I did climb, it was a rather tentative and worried affair. Part of me felt that I would not ever be able to climb even adequately again; part of me didn’t want to get a hand surgeon’s opinion, lest it confirmed my worst fears. This was not a great mental attitude to adopt obviously and I rather felt that a chunk of my life was missing, or at least going badly. However, having recently relocated to Cambridge (England not Massachusetts), my partner and I discovered the Kelsey Kerridge Sports Centre and learnt that their indoor climbing wall was in the process of being extended and upgraded. Just before Christmas we went along, to be honest without any great expectations; either of the wall or the standard of my climbing. However we were pleasantly surprised by a relatively extensive and modern facility and some very well-set and interesting problems (for an explanation of why climbs in bouldering are called problems and indeed a definition of bouldering, see Perseverance). Another plus is that many of these used plastic holds (manufactured by Sheffield’s Core Climbing) that were quite friendly to injured fingers; or at least at the lowly grades that I was initially climbing at. Since first going we have become regulars and even interspersed a couple of trips to our old London climbing haunt of The Arch. I have been taking the (probably psychological) precaution of using climbing finger tape to bind up the damaged area. I learnt my lesson and started on easy ground with little potential to aggravate my finger. The build up to harder climbing (for me) was measured, despite a growing desire to push myself. So far, despite a couple of twinges, it has been going OK. The quality of setting at Kelsey Kerridge has been such that, though not much has changed at the wall since mid-December, as my climbing has steadily improved, I have been able to find more interesting problems at the next level. Indeed I seem to have found a number of projects (again see Perseverance for a definition), at an increasing level of difficulty and which have taken between two and five sessions to finally crack. Two sessions ago, I finally got up my first indoor V4 in literally years. This was something of a landmark not only because it means that I am getting back to the vicinity of where I was pre-injuries, but more specifically as the problem requires a big, dynamic move onto a small edge for my damaged left hand. It even began to feel quite comfortable making this move after a while. Even now, I am still taking to heart the learnings that I pointed out in earlier articles and am not trying to push things too quickly. However, I am have now completed several climbs that I could not even pull onto a few weeks back and have some harder projects on which I am making significant and somewhat surprising progress. It feels good to be back climbing at any level and even better that my hand is – [undamaged] fingers-crossed – holding up so far. A positive learning here is that when you feel at a low ebb – as inevitably happens to the most enthusiastic of project managers, running the most dynamic and important of projects – maybe the physical act of doing something is the best antidote. Even if what you do does not work out immediately, it may provide you with other ideas that might be more successful. Contemporaneous to this climbing progress, I am taking on new challenges in my work life. At least for me, success on climbing projects gives me a great fillip when thinking about the longer term projects I face in a work context. Success in one area of life can be contagious. Making slow, but steady progress at the wall makes me feel that many things are possible in my professional arena. It is nice to be back in what I hope will continue to be a virtuous circle. A minor update, I repeated the V4 boulder problem I reference above last night. However this time I did it statically rather than dynamically. As is probably evident, a dynamic move is when you use momentum to help you reach the next hold, this can range from a smooth transfer of weight to a full-on jump (the closer you get to jumping, the more frequently the contraction “dyno” is used to describe what you do). Sometimes there is no alternative to a dyno, but sometimes it is weakness that prevents you from taking a different approach. Doing a move smoothly and in control, where I was having to jump and hope before is even more a sign of progress than climbing the problem in the first place. A video of my partner climbing the same problem as I am in the above video and then a much harder (V5) one can be seen here.